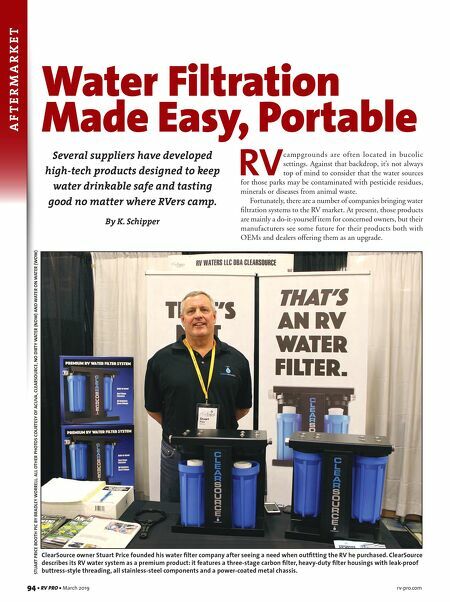 rv-pro.com March 2019 • RV PRO • 95 Seeing the Need While the technologies that make these water filtration sys- tems work vary, many are being developed by people who have personal ties to the market and see the need. Stuart Price, founder of Rancho Santa Margarita, Calif.-based ClearSource is one of those. He saw a need when outfitting the RV he purchased. "I was trying to find a water-filter setup and thought there was a gap in the marketplace," Price says. "I founded the company, came up with a design, sourced the materials, and made prototypes, and we've gone from there." The initial ClearSource system was designed to fit between the end of a campground water hookup and the RV, and Price says it features a three-stage carbon filter, a stand and better materials than what had been on the market. "We realized there's a market for a high-quality system, but some of our customers wanted it mounted internally," he says. "Our onboard system comes with a stainless-steel mounting system, so it stays put, and we offer PEX (cross- linked polyethylene) adapters so it can be plumbed directly into the RV water system." Tim Beall, CEO of Torrance, Calif.-based WOW Water by Topper Mfg., tells a similar story. An RV owner, he also has more than 40 years working for Topper, a family-owned plastic injection molding company. However, rather than using carbon filters, the WOW system utilizes reverse osmosis for its water filtration. "WOW is an acronym for Water-on-Water, which is the name of the technology that is internationally patented by Topper," he says. "I'm the surviving member of the original development team that invented the Water-on-Water pro- cess. In 2004, I brought a team of individuals together and developed the WOW RO by Topper, which is a very compact reverse osmosis system." It's the compactness of the system that led Beall to mar- keting reverse osmosis to the RV industry. "Not only does it fit into the tightest spaces, but what's unique about this technology is it operates at a much lower pressure than a traditional home osmosis system," Beall explains. "Our competitors have a minimum operating pres- sure of 45 psi (pounds-per-square-inch) and at that minimal amount of pressure they barely produce water." By comparison, whether it's from an on-board pressure system or via a park water supply, the WOW RO operates with pressures as low as 20 psi. Miniaturing Success Nor are those the only technologies available for water puri- fication at the RV level. Both NDW (No Dirty Water) and Acuvatech Technologies have taken existing technologies and shrunk them to RV-scale, although in the case of NDW, not necessarily with that market initially in mind. Lansing, Mich.-based NDW and its parent, Created 2 C(reate), are the brainchildren of former Spartan Motors CEO John Sztykiel and his wife, Joni. Sztykiel explains that the whole idea kicked off in 2008 when the couple adopted a little girl from Ethiopia. 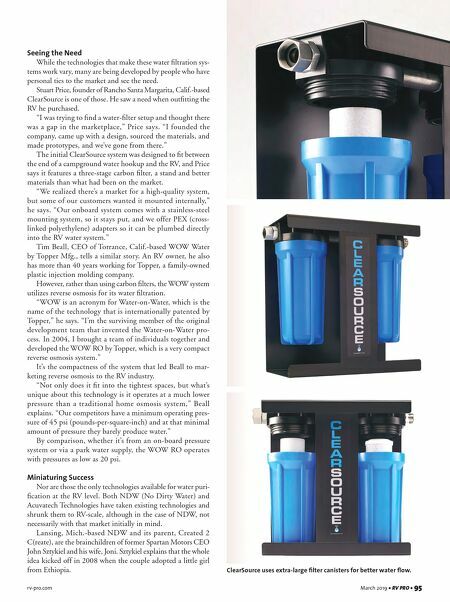 ClearSource uses extra-large filter canisters for better water flow.